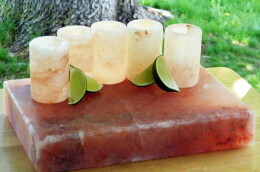 Salt Walls to Salt Lamps – A Brief Comparison is designed to help ensure that you are satisfied with the results of your incorporation of Himalayan Salt into your home environment, this article touches upon the aspects of your life that should be considered, and help give you a good idea of which option to select when deciding on a salt feature. 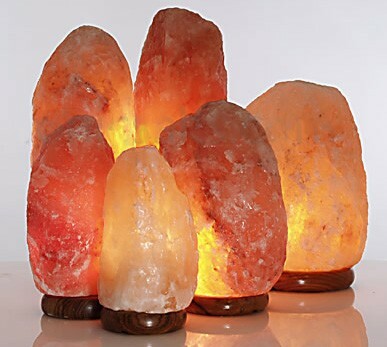 Salt Walls and Salt Lamps are both excellent choices for those who would like to add a therapeutically beneficial, earthy décor element to their home. Considered by many to be one of the most enchanting, innovative and naturally beneficial decor elements available today, Salt Walls and Salt Lamps are becoming increasingly popular additions to homes around the world. With this increasing popularity comes the common question of which option is best, but the answer to this question is actually which option is best for you. 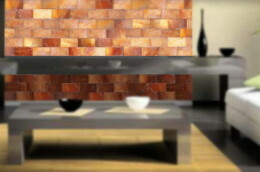 Choosing the right Himalayan Salt feature for your home, strictly decoratively speaking, depends on the effect you wish to achieve, and how much time and expense you are willing to invest in order to achieve it. These two options offer different appearances and styles, with different installation requirements, as well as costs. Salt lamps are made of pure Himalayan Salt crystals, either in the natural crystal form or hand carved into artistic shapes. These are the easiest and least costly option for incorporating salt into your home lighting and décor scheme. They can be placed throughout the home for completely unique, earthy lighting, while providing unique sculptural conversation pieces when the light is off. Salt lamps can be easily moved to accommodate for other uses of the space, just in case you need that countertop space for a gathering, that coffee table space for a chess game, or you simply decide you would like to move the lamp elsewhere. Installing this option requires no more effort than determining the perfect areas to place the lamps, making sure there is a sturdy surface to set them on, then plugging them in and enjoying the glow. 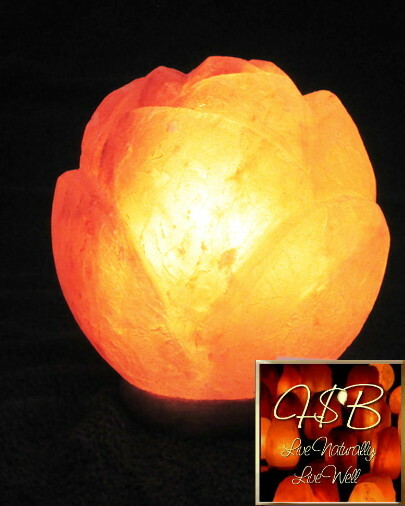 As each salt lamp is entirely unique, the lamps are not a permanent alteration to your home, and the cost of the lamps is minimal, this is the most affordable and easy way to incorporate Himalayan Salt décor throughout your home. Salt walls are constructed from solid, 100% pure Himalayan Salt blocks, and can be used to incorporate small to large, entirely customized, permanent salt features into your home. 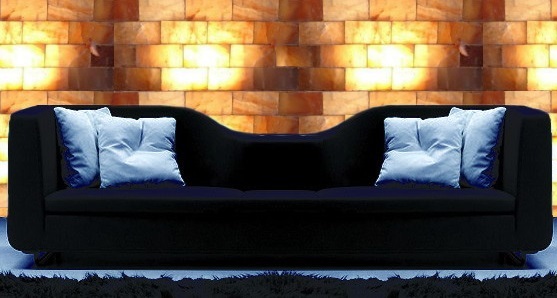 The salt blocks can also be used to create smaller, artistic, lighted wall features which can be moved just like a painting, creating a look entirely unique to your home. The salt blocks used to make both of these features can be arranged into different patterns, and different dimensions of blocks can be used to create mosaic designs. Salt walls can partially cover an existing wall, cover the entire wall from floor to ceiling, or be used to lend sensational lighting and décor to the front of a kitchen island, or other cabinetry work. Though the cost and installation of salt walls is obviously more extensive, ultimately more permanent, and there are some structural requirements to consider, these decorative features are a uniquely impressive, highly effective way to alter the look and feel of your living space. 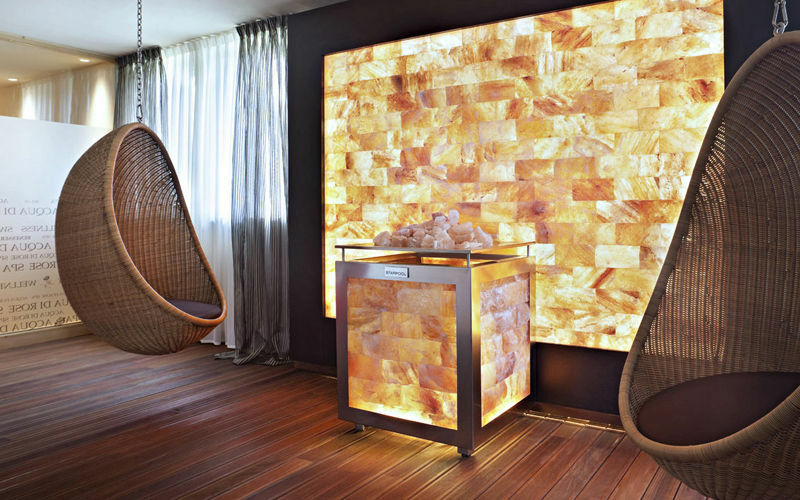 Despite the cost and extra installation efforts, the introduction of salt walls into home décor is increasingly popular, especially as more and more people have the opportunity to experience these strikingly unique features in hotels, restaurants, spas, and resorts. It is not uncommon for those who spot these captivating features in commercial buildings to immediately begin rethinking their spring home renovation plans! 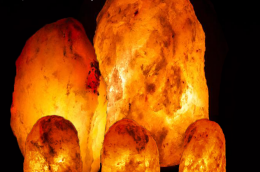 Salt Walls and Salt Lamps both provide natural ionization for any space, cleansing the air through the scientifically proven effects of negative ions; in short, by removal of harmful particles and allergens from the surrounding atmosphere. 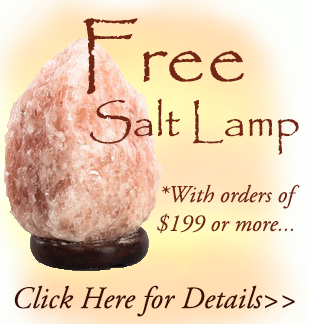 While an adequate number of salt lamps, or the appropriate size of salt lamp for a given space, will provide sufficient coverage to benefit from the ionization effects of the salt, those with more severe allergies or other respiratory conditions may want to consider adding a salt wall, or even a salt room to their home to simulate salt cave therapy and treatment. The therapeutic effects of salt also include those experienced when breathing microscopic particles of salt emitted into the air by a salt feature, a treatment known in Europe and other countries as Splenotherapy (see more here). Long story short, dust sized particles of salt help prevent and reduce infection when introduced into the respiratory system. The amount of particles introduced into the air are directly related to the size of the exposed surface area of the salt, therefore salt walls are likely to introduce more microscopic salt particles into the air than salt lamps. Upon finding that their children benefited greatly from salt treatments in established salt cave facilities, a good number of parents who have children with severe allergies have added entire salt rooms to their homes for use as children’s’ play rooms, or bedrooms. Their children are able to benefit from the effects of extended exposure to salt air without regular visits to salt therapy facilities by converting a frequently used area of their home into a “salt therapy cave”, or creating an enclosed “salt cave” independent from the structure of the home. Salt walls have also become a popular feature for saunas and bathrooms, lending their tranquil, glowing beauty and natural health benefits to these areas of the home as well. It is important to note however that any salt feature placed in a moist area will deteriorate from frequent exposure to excessive moisture. One of the most interesting aspects of Himalayan Salt décor is the ability of the salt to be used in different manners to alter the look and feel of a home, while offering natural air cleansing abilities. Deciding which of these salt features to add to your home depends heavily on your own personal circumstances, as well as your reason(s) for adding this element to your home. 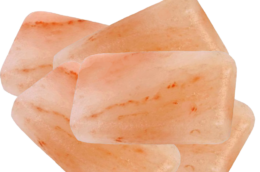 A quick consideration of the outcome you wish to accomplish, and the comparative information contained in this article, Salt Walls to Salt Lamps – A Brief Comparison, will easily point you to the salt feature that is right for you. Once you have made your decision about what type of Himalayan Salt décor you want to add to your home, the Himalayan Salt Boutique offers quality products for both of these options.